I love stew. What is better than a nice bowl of warm, comforting, flavorful stew? Honestly, I don’t think there is much better. Besides, you can stretch it out for a few meals, it is cost effective, it is quick cooking, you control what goes in it, and well, it is absolutely perfect for this weather. If you read my blog you know that I like to find ways to give dishes a little twist. Let’s face it, like so many other dishes stews run the risk of always being exactly the same. So here I am, it is raining cats and dogs in the Pacific Northwest and I am looking for a twist on stew. Like an episode of Chopped, I look around the kitchen to see what mystery ingredients I have around. I keep noticing the butternut squash in the vegetable rack that I haven’t really figured out what to do with that. Also, I want beef, but beef hasn’t been my cooking buddy. I will talk more about a little bit later. The only thing that comes to mind is to throw a bunch of broth in with the beef, butternut squash, and let that come together. Although this method is perfectly acceptable, I wanted something else but I just wasn’t sure exactly how to find that balance. First up, I needed to find a recipe that was going to to work for me. Before I began the recipe search my brain began wrestle with the big elephant…err…beef in the room. Okay, it is cooking confession time. Most of the stews/braises I have made have all been pork for some time now. I know, why am I talking about about pork when the issue is beef? It will all make sense, but you may have to humor me a little bit. I have been using pork because it is pretty hard to mess up and it is darn consistent when it comes to flavor. The meat is always tender, flavorful, and never misses a beat regardless of how it is served. Unlike the last few times I have done beef stew meat, which has come out dry and a little tough. What really makes that a mystery is when the recipe tells you the meat comes out tender and moist, and you get quite the opposite. This has happened the last two times I have made beef stew. I do the same thing every time; which is season the meat, sear it to coax some color and flavor out, and then add to the stew accordingly. The meat always comes out well seasoned, but misses the mark on texture and mouth feel. So I began to do some research on how to avoid this and learned something very interesting. 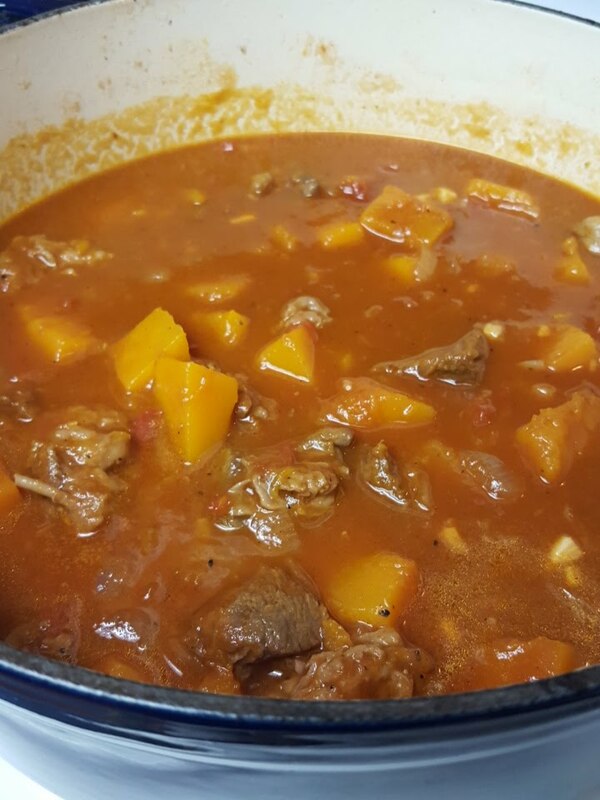 Simply put, between the searing of stew meat and the meat cooking in the stew for a certain number of hours, you force all the moisture out of the meat long before the other components of the stew are cooked and have melded together. Since stew meat doesn’t have a lot of surface area, it is hard to keep moisture in while trying to achieve all the other things you want. How do you resolve this problem? Cook your meat in one piece to achieve your color and flavor, cut it down to desired size, and then you can add this to your stew to ensure you have tender meat. If you want more information on the article, click here. Now that the question of how to cook the beef was solved, it was time to find a recipe. Off to the google-verse I went to complete my search. Surprisingly, it took a few searches to find what I wanted. However, something in this recipe spoke to me. The recipe used spices that are synonymous with winter and the base of the stew was a combo of tomato products and beef broth. I was suddenly inspired when I saw cumin, ginger, coriander, and more. Although these can be very pronounced and can overpower, they create an amazing warmth in the back of your throat with each bite. Plus, the recipe claimed you could have stew in fourty minutes!! As Barney from How I Met Your Mother would say, “Challenge accepted!” Just like that, it was on! The prep for this is pretty simple. The big challenge is how to peel, remove the seeds, and cut up the butternut squash. If you go to your local grocery store you might find some that is ready to go in your produce section. This is a great time saver for sure. Keep in mind, you will pay a little more for the convenience of the work being done, but it isn’t worth losing sleep over. Alright, ready to look at a recipe? Lets do it! This recipe has been adapted by me, but you can click the link if you want to view the original. 1. Add your oil in a dutch oven or heavy duty, high sided cooking vessel over medium-high heat. 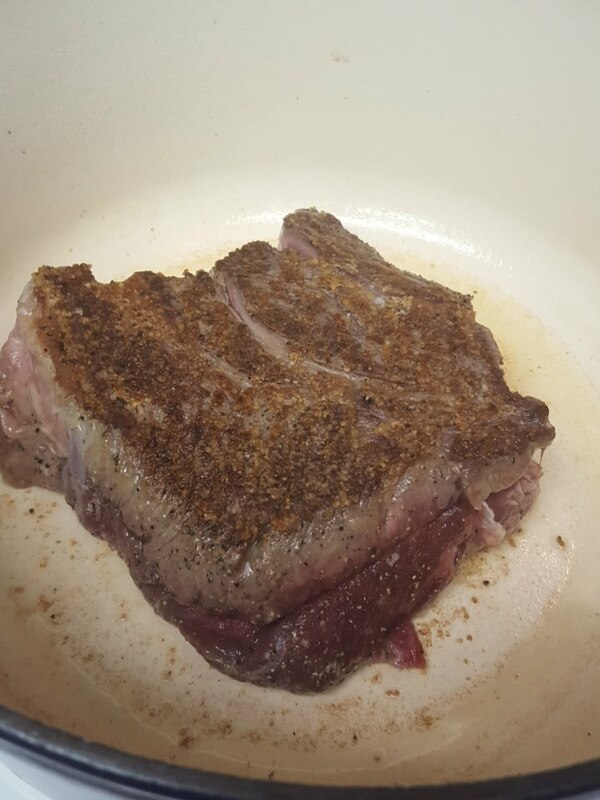 Cook whole piece of meat until it is browned and carmelized, 5-7 minutes a side. Set the meat aside on a plate. Add onion to pan, and a little extra oil if needed. Cook the onion, stirring often, until softened and translucent — I added a pinch of salt to coax out some of the water in the onion, but this isn’t required. 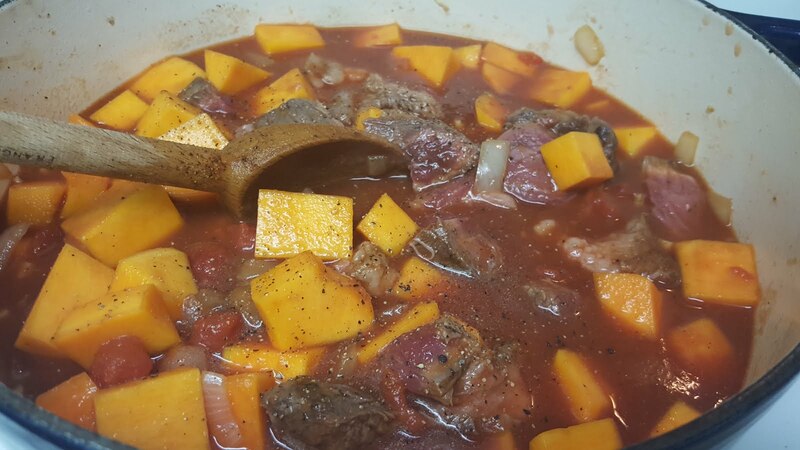 While the onions are cooking, cut your beef into chunks to a similar size as your butternut squash so everything cooks evenly. After your meat is cut up, add ginger and garlic to the onion mixture. Stir this into the mixture for at least one minute to allow the oils in the spices to bloom. 2. Place the cut beef back in the dutch oven. Add squash, diced tomatoes, tomato sauce, beef broth, cumin, cinnamon, red pepper flake, and all other spices. Bring the mixture up to a boil, stirring to make sure everything is incorporated. Reduce heat to a simmer and cover, stir occasionally. Cook until beef is tender, about 35-40 minutes. 3. Serve with couscous, rice, bread or add a dollop of yogurt. Sprinkle with almonds and parsley, if desired. This recipe makes about 8 servings. That is it! Just that simple. You know what is most surprising about this to me? You really can have delicious, tasty stew in less than 90 minutes! The idea that stew will always take 8 hours are gone! Honestly, I can’t believe it. In case you are wondering why almost every item in the ingredient list is in italics, that is because those are changes I have made from the original. Parts of the recipe were just clunky, weird, and didn’t make any sense. Hopefully my changes will help smooth things out and make the recipe easier through and through. I have a couple of final thoughts to share about this recipe as well. This stew will intensify in flavor as it sits and the flavors have a chance to merry together. It will be better the second and third day than on the first day. Don’t believe me? Ask any Italian grandmother and they will set you straight. This would make an awesome vegetarian stew as well. Just substitute beef broth for vegetable broth, remove the beef, add a few more long cooking veggies and consume! I think the best thing about this recipe is it is a killer option to freeze the leftovers for a quick weeknight meal or on the days where you don’t feel like cooking. As always, feel free to send me an email or comment on the recipe and let me know what you think.